Some weeks ago I saw this press release post by Korea Tourism Organization Manila Office (KTO Manila) in their Facebook page. My heart seemed to leap when my eyes came to these words: “Filipinos who have visited Korea at least once are now eligible for a one-year multiple-entry visa under the new rules.” OMG! I’ve been to Korea once in 2010 and I’m planning to visit again by end of this year. So this is really very good and timing news not just for me but to all Filipino Korea lovers out there. I think this is the time to visit Korea again and tag along first timers. Read on the full article below on relaxed South Korean Visa rules. Credits to KTO Manila Facebook page. As I googled more about it I discovered that it has been out in Philippine publications websites as well since the latter part of August this year. When the South Korean government relaxes its visa rules starting September 1, the Korea Tourism Organization (KTO) Manila Office expects more Filipino tourists to Korea. Filipinos who have visited Korea at least once are now eligible for a one-year multiple-entry visa under the new rules. Those who have visited Korea more than twice are eligible for a three-year multiple-entry visa. And visitors who previously held a three-year multiple-entry visa can now obtain a five-year visa. Rules have been relaxed for Chinese and other Southeast Asian nationals, too. Mr. Sangyong Zhu, director of KTO Manila, is positive that easing visa rules will translate to more visitors to Korea. “Korea is always ahead in visa processing compared by other countries. We are confident that visitor arrivals to Korea will surpass more than 12.5 million visitors again this year, “he said. From January to July 2013, Korea welcomed more than 6.3 million visitors. Isn’t this info so adrenaline-rushy? 🙂 I personally called the KTO Manila office and posted a question on this post. I asked them if I’m eligible for a one-year multiple entry even when my first visit was 3 years ago and they replied back that “Yes you are eligible, but it still depends on the Consul’s decision”. So that explains it, it’s not a 100% guarantee but still the chance of a multiple entry is there and it’s easier now compared to before that you have to have visited SK multiple times in two years (as far as I know and have read in blogs). And they also mentioned that the visa application procedure is still the same, they just relaxed the multiple entry visa eligibility. Just a disclaimer though that KTO Manila is not in any way responsible for approving or granting South Korean visa. 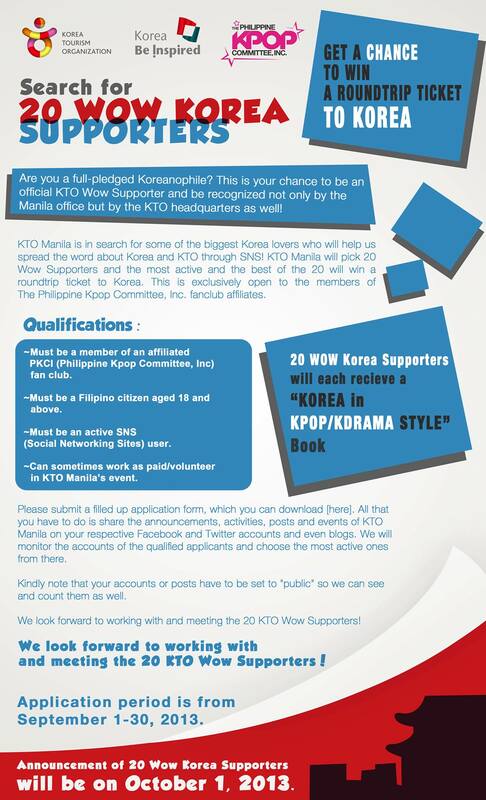 The application is made through the Embassy of Korea in the Philippines. You can refer to this link for the requirements and procedure. I can still recall when I saw this post in Facebook when a fellow Korean fangirl friend tagged me last Aug 31. My initial reaction is “OMG! WOW! What’s this?” Everything Korean sounds like a happy pill to me so I immediately clicked on the post and found these details. I am really super thrilled knowing this thing. One of the important qualifications to join aside from being a Filipino citizen of legal age and active in social networking sites one must be a member of Philippine Kpop Committee, Inc. or PKCI affiliate fanclubs. I’m so lucky enough that one of the Korean fan clubs I’m a member of is affiliated. Yey! Wahhhhhh! It really pays to be a true blue k-fangirl. Super thanks that Eels Philippines (a Jang Keun Suk fanclub) is included in the list. Love you more Sukkie. ♥ You can click here for a full list of fanclub affiliates of PKCI. Kindly visit Korea Tourism Organization Manila Office Facebook page or follow them on twitter @KTOManila for more details and updates on Korean tourism, culture and travel.